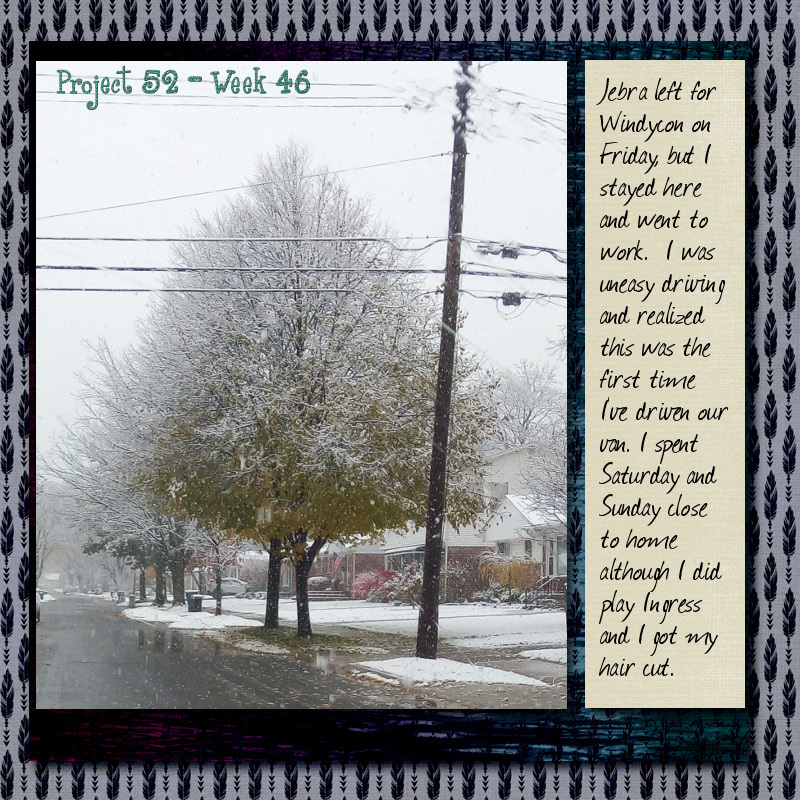 The tree featured on today's scrapbook page was stunning in real life and, to the best of my recollection, the first tree I've seen where the top was bare branches coated with snow while the lower portion's hadn't yet dropped its leaves. I was so impressed I had to drive around the block and return to take the photo. I had a quiet weekend while jebra was in the Chicago area for Windycon. I finished three cat beds while he was gone, hung out with the kitties, and got a ton of stuff off the DVR. I went out for my daily hacks but did so in the car as there was no way I was going to risk walking around in the snow without a responsible adult near by. I'm still terrified of slipping and falling when the ground is not clear and dry, which signals I'm in for another rough winter. Not that it is winter yet. In mom news, she's still at the rehabilitation hospital. I talked with her yesterday. She's eager to get home and tells me that new health aids, such as a shower chair were arriving at her house in preparation for her return home. Which should occur this Friday. Her mood is better than good and she's coping with the boredom of the hospital by taking her walker and cruising the halls. I think that's an indication she's doing much better and that she'll be able to care for herself once she's home. This morning I'm at home waiting for the furnace technician to arrive. It's time for our annual furnace check up and filter exchange. After that, it's off to work with me and hopefully jebra too. He wasn't feeling well when the alarm went off and so far today is still in bed. This entry was originally posted at https://mrs-sweetpeach.dreamwidth.org/986175.html.